My family and I had never visited Sodalis Nature Park, 7700 S. County Road 975 East, Plainfield, so we went to explore on a warmish Saturday earlier this month. My daughter needed to collect natural items for a school project, and my husband and I wanted to check out the hiking trails. This was also an opportunity to spend an afternoon/evening enjoying the Plainfield area. Before this "adventure" began, I looked over the park map knowing my kiddos (ages 7 and 4) would not be able to hike the 3.5 miles of trails. It was not difficult to map out a route that covered a shorter distance yet was long enough to appreciate some of the 210 acres of beautiful woodlands. Upon entering the park, we immediately felt the quiet, peaceful seclusion of our surroundings. We decided to hike the trails first before checking out the picnic area and 5.5-acre pond. A pretty waterfall and an area overlooking the pond with a bench and a few large rocks greet you at the beginning of the trails. 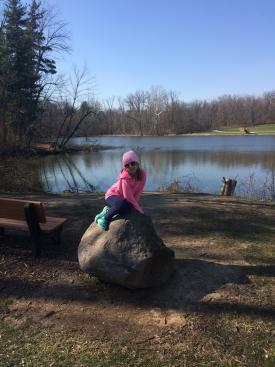 My oldest daughter loves climbing on rocks and, of course, it was the perfect view to take some attractive photos. Our starting point was Beaver Trail which has a gravel surface at the beginning and then changes to grassy terrain. One can avoid the gravel by choosing Oak Trace Trail. As we hiked further into the park (Conservation Way and Bat Haven Trails), the grassy terrain became more wooded with dirt surfaces and had a few inclines. All five trails fall into that easy to moderate range making each accessible for all ages. Hiking all 3.5 miles of trails would take about an hour. We saw families, couples, individual hikers and a few really happy looking dogs! These scenic trails would be ideal for a casual run/jog as well. Totem pole-like structures serve as trail markers and are very straightforward (even for those directionally challenged like myself). Along the trails, various informational signs are posted. Adults and children alike can enjoy reading the material and looking at the pictures. 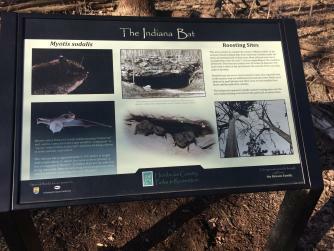 One sign showed pictures of the Myotis Sodalis bat, for which the park is named. In fact, Sodalis Nature Park "exists within a permanently protected conservation area established to protect this endangered bat." Another sign described some of the native Indiana wildlife living within the park. We did not observe any wildlife on our afternoon hike but apparently it is a fairly common occurrence. Like all of Hendricks County&apos;s trails and trail systems, Sodalis Nature Park trails are clean, well kept, surrounded by natural beauty and have picturesque views! Once we finished our hike, we ventured via a multi-use paved trail over to the pond and picnic area. The kiddos absolutely had to check out the fishing pier and observation platform. The views were beautiful and the pier is ideal for "catch and release" fishing (the pond is catch and release only). 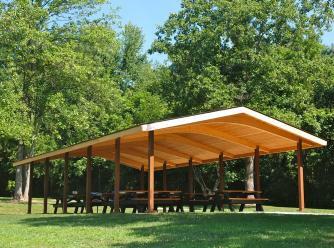 When the weather warms up, our return visit will include picnic supplies, so we can enjoy the picnic area. The pavilion is available year round for rental and is a perfect venue for groups. The parking lot is within close proximity to the multi-use paved trail, pond, picnic area and beginning of nature trails. No plumbed restrooms are on site but a porto-potty is available. Both the fishing pier and picnic area are handicapped accessible. Nature programs are offered throughout the year. "Signs of Spring" takes place from 11 a.m.-noon, April 29. A park naturalist leads the hike (terrain is easy to moderate). Click here for more details. Surprisingly, my daughters still had some energy after our visit to Sodalis. They wanted to visit Hummel Park&apos;s playground which is just a short drive from Sodalis Nature Park. We had plans to dine at one of the many restaurants in Plainfield (unfortunately, we had car trouble and couldn&apos;t go, but that&apos;s a story in itself). Both visitors to Hendricks County and locals will enjoy this lovely, peaceful park. Bring the family or a friend for an outdoor adventure! Be sure to make a day of it and check out Plainfield&apos;s other parks, shopping and restaurants.